NanoScreen, an industry leader in automated liquid handling, announced today that it’s quality management system processes have been certified as compliant under the ISO 9001:2008 standard. “As a leading liquid handling provider, it was essential for us to achieve ISO 9001:2008 certification, demonstrating our commitment to a strong culture of quality”, said Garey De Angelis, CEO of NanoScreen. NanoScreen, an industry leader in automated liquid handling, announced today that it’s quality management system processes have been certified as compliant under the ISO 9001:2008 standard. This certification applies to NanoScreen’s management system governing the product design, manufacturing and sales of instruments and consumables. “As one of the leading liquid handling providers, it was essential for us to achieve ISO 9001:2008 certification, demonstrating our commitment to a strong culture of quality”, said Garey De Angelis, CEO of NanoScreen. 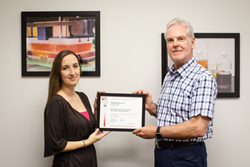 “Receiving ISO 9001:2008 certification demonstrates NanoScreen’s dedication to meeting or exceeding the expectations of our customers in the design, development, manufacturing, sales and servicing of liquid handling products”, said Tiffany Benford, Director of Quality Assurance at NanoScreen. ISO, International Organization for Standardization, is the world’s largest body of voluntary international quality management standards. Important components of ISO 9001:2008 include customer satisfaction, continuous improvement, and preventative action. Founded in 2003, NanoScreen designs and manufactures instruments and consumables that are used by most of the major pharmaceutical and biotech companies in the world. We specialize in providing solutions that allow researchers to precisely and simultaneously transfer hundreds or thousands of compounds via an automated liquid handling system. The company’s core competency is in the manufacturing of high density air displacement heads, disposable pipette tips and robotic liquid handling workstations.